The 2013 Surfaces Annual Floor Coverings Show, International Builders Show (IBS) and World Market in Las Vegas ended last week and Brandy Marsh, Area Floors CEO was there to see first hand the latest design innovations for 2013. According to Brandy a major theme throughout the show was reinvention of the old classics. Recognizing that the economy and environment continue to shape most product offerings, there was a renewed interest in recycling, reusing and re-purposing The show had over 300 different building industry categories with over 900 exhibitors showcasing their latest products all of them giving a nod to sustainability. Simplicity in design resonated across all of the exhibits including bathrooms with spa-like atmospheres through the use of natural light, reclaimed bleached wood and minimal clutter. This year’s bathroom designs have a new emphasis on functionality and less on gaudy opulence and heavy colors. The crystal chandeliers and roman architecture of past bathroom styles has been replaced with white Carrara Marble— on walls, back-splashes, counter tops… white just about anywhere. Also popular were the classic wood-grains such as Ash and Teak re-purposed by painting them white, biscuit or another neutral color maintaining an open breezy feeling of spaciousness even in the smallest of bathrooms. 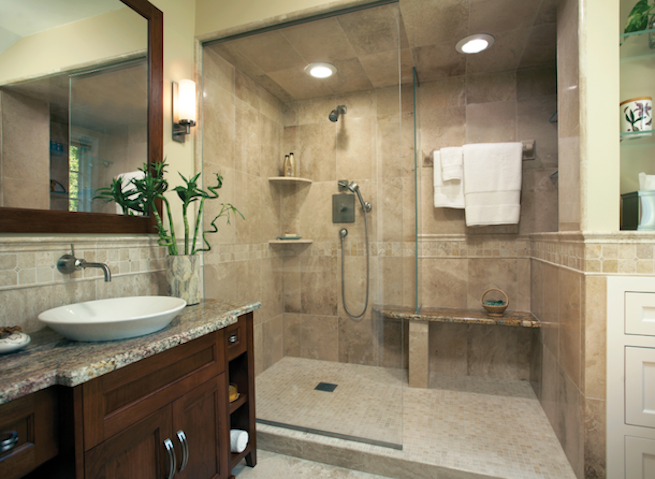 This open feeling is further accomplished by eliminating extra walls and adding transparent glass enclosures similar to what we saw in the bathrooms of the Overlook home of the 2012 Parade of Homes.